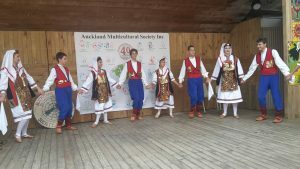 21st Lakeside Multicultural Festival 2018 – AMS Inc. 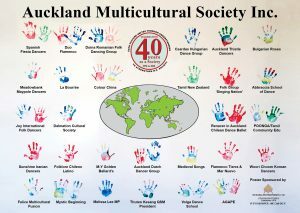 This year the Auckland Multicultural Society Inc. is celebrating 40th year of its foundation since its foundation in 1978. 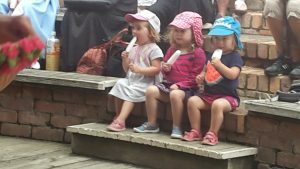 Also this year is the 21st year of the Society’s holding our Lakeside Festival at the PumpHouse on the North Shore. The committee decided to have a large mural printed to reflect our 40 years of existence and acknowledge all the participants that have been involved with our Society for many years, so I suggested that as well as our logo we could create another logo to reflect 40 years. The committee was quite happy and asked me to come up with the design. I designed the 40 year logo and incorporating a world map and add the hand prints of all those assisted with performances over the 40 years. Ana Maria de Vos Sanchez, our Treasurer, supplied the names of all those who took part. When I finished the design, I submitted to the committee for approval, which was approved. The committee decided to invite all for lunch and in the same time each one put their hand print on their names. and I had the big mural (2 and half M long by 2 metres wide) laid on my garage floor, with four plates of colours, ready for people to put their hand print on. After lunch we had Melissa Lee MP to say a few words and then we presented them with certificates of appreciation. Then we got everyone to put their hand print on one by one and then let it dry for few days. Arrangements were made with those who could not make it on the day to come another day and add their hand print. 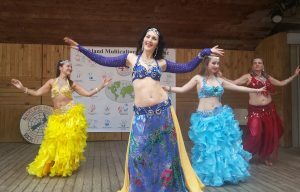 The mural was used as a back drop during our 21st Multicultural Festival 2018 at the PumpHouse on Sunday the 18th March 2018. Our Lakeside Multicultural Festival 2018 clashed with the Dragon Boat Festival on Lake Pupuke and the parking was at a premium that day. The committee arrived between 9 – 9:30 am to set up the stage etc. I took the opportunity to distribute programes to the Dragon Boat Festival people and it worked well as a lot of them came to watch the show. We were lucky to have a very good weather and the Festival went according to plan. Our Patron the Mayor of Auckland Hon. 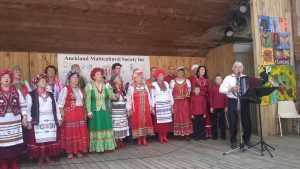 Phil Goff spoke of the work of the Multicultural Society for last 40 years and spoke about Auckland being the largest Multicultural community in the world. 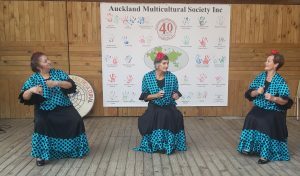 The Society has played a key role in promoting Multiculturalism in Auckland and thanked the committee and said may it continue for long time. Then the programme started at 1:15 pm – 5:15 pm, we had 24 groups performing the whole afternoon. In between the programmes we had Dame Susan Devoy, Race Relation Commissioner to say few words and also our dear friends Melissa Lee MP who has supported the Society for many years. They both congratulated the Society for the 40 years of service and continuous successful Multicultural Festival we hold each year. 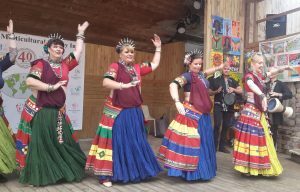 The programe opened with Bulgarian Roses with their very colourful costumes doing some traditional dances which was followed by young children from the Yifeng Dance School who performed beautiful Chinese dances and with such a lovely costumes, they looked stunning. Another group of beautifully dressed children from the Russian Show Group AGAPE were delightful and how these children danced showed that they were enjoying as though they were playing a game. Another act that was slightly different was Medieval Songs by Patrick Bowman. He explained about the songs and it was sung in Gaelic and he had the costume to go with the act.